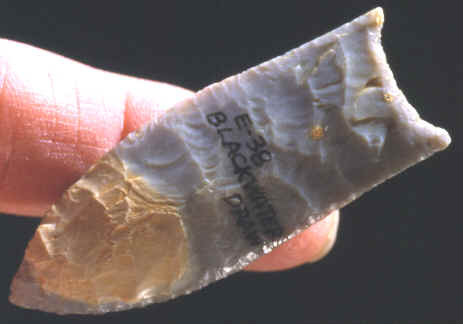 This Midland point was found sometime in the 1930's at the Clovis Gravel Pit in Curry County, New Mexico before it was named the Blackwater Draw site by archaeologists. Blackwater Draw was a Paleo-Indian mammoth and bison kill site. Midland points were named after the town of Midland, Texas from examples found on the Scharbauer site located nearby. 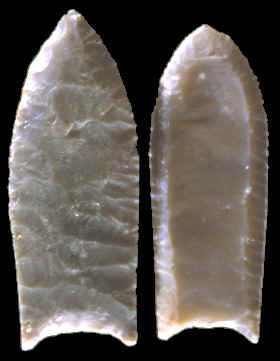 Some archaeologists believed that Midland points are unfluted versions of Folsom points. Some of them may be Folsom points that were to thin to flute. But Midland points do seem to be an independent point type because some sites only produce this style of projectile point. This Midland point was originally in the Charles Rhoton collection. It's made of a blue-gray chert of good quality and measures 2 1/4 inches (5.6cm) long. Both of these spear points were found on the Blackwater Draw site sometime in the 1930's. The Folsom point on the right is available as cast number P-21. 1985, "Selected Preforms, Points and Knives of the North American Indians," Vol. I, by Gregory Perino, p.253. Personal communications with Forrest Fenn.